How to create a case from an email? Home » How To's » How to create a case from an email? Before we explain how you can create a case from an email, let’s briefly explain the importance of a case in the CRM context. During your day-to-day interaction with leads, contacts and other records, you may and will need to address and solve various problems. Any time a lead or contact experiences trouble like getting started, technical support, or any other problem, you need to be there and solve that problem. That’s where cases come into play. In Flexie CRM, you can easily create cases directly from the email. 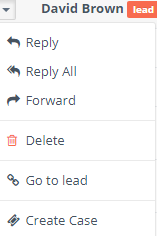 To do that, first go to Mailbox and on the drop-down menu click Manage Mailbox. You will see the mailbox with all the emails. Let’s suppose one of your leads, David, is having troubles getting started with your service. In order to help him get started, you need to create a case. To do that, go right beside the lead’s name and on the drop-down menu click Create Case. Choose a title, select the owner of the case and as a source choose Email, since the lead has contacted via email. Because you want to help the lead get started, set the category to Help. You need to solve the problem as soon as possible, that’s why you need to set priority as High. 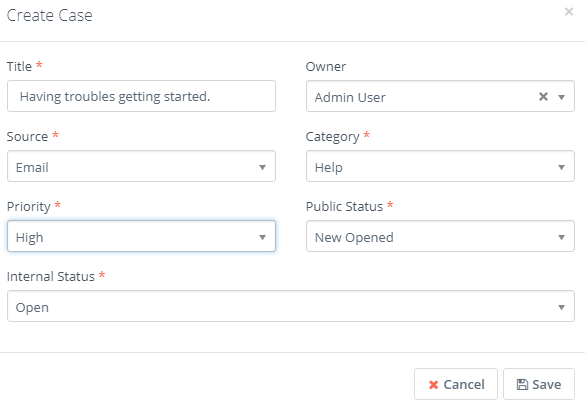 The Public Status can have many stages, depending on the user’s specific requirements. The Internal Status, on the other hand, is set by default. You can either set it to Open, Pending, or Solved. Since you’re about to create the case, set it to Open. Next, click Save. You’ve just created a case directly from the email. This was just concrete example of many where you create a case from an email. To see how you can do that, please check the video below. For more videos and updates, please subscribe to our YouTube channel Flexie CRM .